All the best in his recovery. Any speculation on who might be available to fit that role? Guys that would make sense (to me, at least) include Andy Andreoff (Ontario), Joseph Cramarossa (WB/S, and the Heat are familiar with him), and Brandon Baddock (Binghamton). All of them play for teams that are well out of the playoffs and who probably wouldn't have any issue giving them up. Edit: Andreas Martinsen (Rockford) could also make sense, considering that he also has decent NHL experience (like Peluso). I wonder if the Wild would give up Marcus Foligno if they feel like Koivu being out has tanked their season. Don't like his contract much, but if he bounces back to a couple years ago it's probably decent. I don't think either of those guys would take kindly to being demoted to the American League. Who is going to shoulder the blame for this? Maybe Kurtis Gabriel off the Devils? He could be someone that fills Peluso's role. But I think the better question is if there is an upgrade available that could play higher quality shifts than Peluso. Is there a Ryan Reaves type player to be had? Maybe not in your or many fans opinions, but given Treliving's and many NHL GMs history, they are very likely to get one. I havent been paying close attention to the Heat, but these guys are most certainly still part of that league and not having one is a bad idea generally. Call Simmonds up and ask him if he's still good at face punching. After Prout's recent performance I'm not convinced we need another guy to fill a 100% enforcer role. Lazar for Lucic (50% retained). 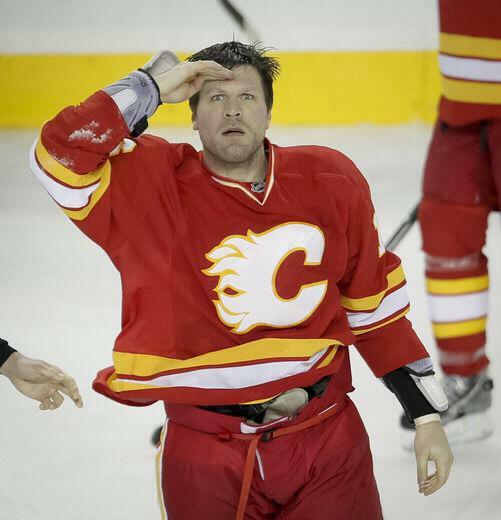 Calgary Flames, PLEASE GO TO THE NET! AND SHOOT THE PUCK! GENERATING OFFENSE IS NOT DIFFICULT! SKATE HARD, SHOOT HARD, CRASH THE NET HARD! -- Are you my Caucasian? I thought the the flames might have been interested in McLeod, bit maybe they weren't due to what you're suggesting. In all seriousness, Chris Thorburn?